It takes a steady hand to pluck the plastic leaves without waking the bees in the Honey Bee Tree Game. 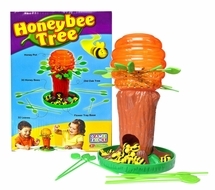 This award-winning game delights children as they try to carefully remove leaves without dislodging the resting bees. Players choose their numbered flower trays and then carefully pull leaves out of the honey tree, being careful not to wake the sleeping bees. If you pull out the wrong leaf or if your hand starts to shake, bees will come tumbling out of the tree onto your tray. Once all the leaves are removed from the honey tree, or all the bees are awake and out of the tree, the players with the least amount of bees in their flower tray is the winner. Choose a numbered Flower tray, turn the Old Oak Tree and you are ready to play. Use all your skill to pull out a leaf without waking any of the sleeping bees.